10 *More* New Kindle Games! I couldn’t believe it. Two weeks ago I wrote a blog post about all the cool new games for the Kindle. And today I discover there’s 10 more games — including another new free game from Amazon! It’s like a crazy hybrid that answers a riddle: What do you get when you cross Amazon’s “Every Word” game with a crossword puzzle? Just like Amazon’s original “Every Word,” this game presents one set of letters at the top of your screen, then challenges players to type every word that could be created from those letters. But this new version adds a twist: all those words form a crossword puzzle! If you’re stuck, just peek at the “across” and “down” words to see how many squares need to be filled in for each word, and see if any letters have already been filled in by the words that cross! 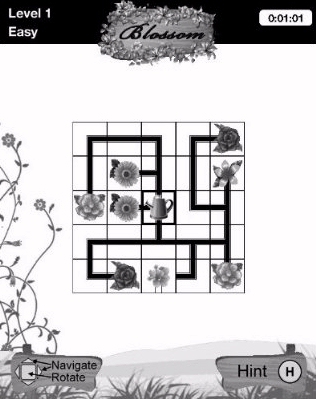 But my favorite new Kindle game combines challenging brain teaser puzzles with…flowers! A grid of tiles represent the pipes that will irrigate the buds into blossoms. The graphics are very attractive, including the vines and grasses around the edges of the screen – and many of the puzzles are delightfully difficult. It’s from the makers of Strimko and Futoshiki, and even though it was released just a few weeks ago, Blossom’s already become one of Amazon’s top-20 most popular games. But there’s another new game that has even more complicated graphics. A series of beautiful greyscale images depict scenes from the search for a missing African explorer. “Explore cities, temples, and ruins,” reads the game’s description on Amazon, “while unlocking the secrets of the professor’s groundbreaking research by finding objects hidden within pictures.” It’s one of the largest games ever released for the Kindle — the file size is 6.7 megabytes. 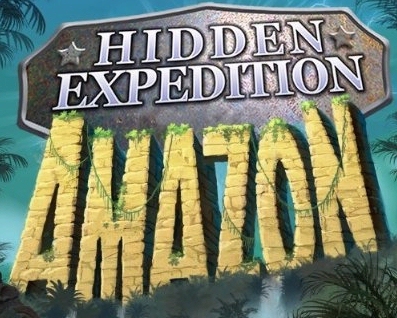 But even at $4.99, Hidden Expedition: Amazon has already become the #1 best-selling game in the Kindle store! There’s also some fascinating new number puzzles. Will Shortz, the editor of the New York Times crossword puzzles, put his name on a new Kindle version of the game KenKen. Like Sudoku, players try to add the correct digits into boxes without using any repeats in each row and column. But in this game, groups of boxes also indicate numbers that can be combined for a specific mathematical result. You’ll either be adding, multiplying, subtracting or dividing all the numbers in the grouped boxes to achieve the result – so you’ll have to work backwards to figure out which digits it could be! 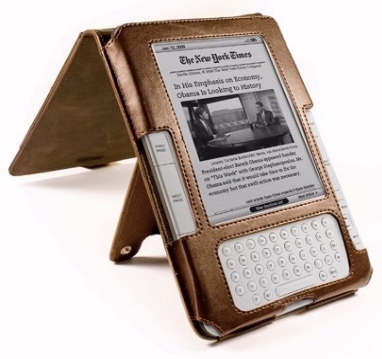 Last month there was also a surprising application for business travelers that was slipped into the Kindle game store. Password Manager lets you collect all your passwords into one secure location, so you can carry them all with you on your Kindle. (Protected by a password, of course.) “Password Manager can store up to 500 items,” reads its page in the Amazon Kindle store, “and includes templates for credit cards, bank accounts, PIN codes, frequent flyer numbers, web site log-ins, memberships and more.” It’ll also help suggest new passwords (and advise you on how difficult they’d be to guess), and “To help protect your data, your data is stored with AES encryption, and a security timeout feature will automatically log you off after 2 minutes of inactivity.” It’s currently priced at $4.99, though it sounds like for some Kindle owners, it could be very useful. But I still think I’d rather play Blossom.